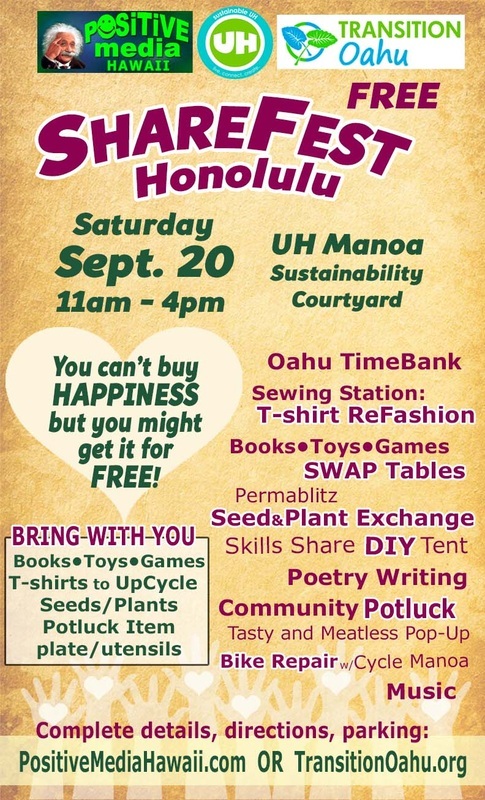 Come and join an organic farm festival at Kahumana Farm and Cafe at 86-660 Lualualei Homestead Rd. This event is a celebration of organic food and allows all people to come and meet their many organic farmers from around the island. Enjoy a beautiful day on the farm with music by Ka'ala Boys and Paul Izak, homegrown grinds, fun for keiki, check out the farm cafe! Important: There is a road closure that requires using an alternative route to get to the farm. Please use this map as your guide. The farm is at point B on the map. Transition Oahu will be at 19th Annual Children and Youth Day at the State Capitol and surrounding Capitol district. Look for our interactive booth at the "Green Zone". Got kids? Trade in some of the old books for some new ones. Look for the RED pop-up tent at the far end of Kailua Beach Park near the Pavilion. There will be blankets on the ground for categories like: Board Books, Young School Age, Older School Age, Middle School/Teen and small space for adult books. Bring some snacks and hang out. Any leftover books that folks don't want will be donated to either Friends of the Library or Kailua Library Book Store. See also the event listing on Facebook.